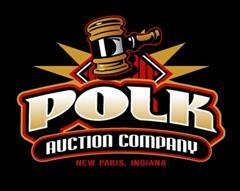 Polk Auction Company is a full service auction company that specializes in Farm and Industrial equipment. We make liquidating your equipment easy, with many options ranging from consignment, to a complete buy-out of your inventory. We are one of the largest cash buyers of all Farm and Industrial equipment. We can come to you and sell your entire fleet, your entire farm, or your collection, or we can help you sell any Farm and/or Industrial equipment you want or need to sell at our own facility in New Paris, IN. We offer Live Auctions along with Online Only Auctions. We offer regularly-scheduled auctions featuring hundreds of pieces of Farm and Industrial equipment that are both our equipment and our customers’ consignments. Polk Auction Company accepts consignments during normal business hours throughout the year, and we offer free nationwide advertising on the internet, in several agricultural and industrial publications, and in our flyers. We also offer a guarantee of sale on most pieces of equipment and the option of setting a reserve price to ensure your return. The Polk Auction feature an assortment of Farm and Industrial equipment ranging from great quality working equipment to antiques to parts tractors. There is literally something for everyone. We have no buyer's premium for on-premise bidders. We offer absentee bidding over the phone and live internet bidding through PolkAuction.com Bidders come from all over the United States and Canada for our auctions and internet bidding brings bidders from all over the world. Check out our website for updates on equipment for our next auction by clicking our logo at the top of the webpage. Polk Auction is excited to announce that we are teaming up with NextLot to offer Online Only Auctions to you, our customer. What this involves is us coming to you and taking care of all the work that is necessary: advertising, marketing, & selling your item. You won't have to haul your item to an auction site; we will bring the buyers to you. It also includes getting your items to a nation-wide network of buyers 24 hours a day 7 days a week. Serving Ohio, Indiana, Michigan, New Paris, Hobart, Goshen.